If you have used previous versions of the ASP.NET MVC framework, you might have probably come across the model binding process and even created a few custom model binders. Similarly those who have used ASP.NET WebAPI, know that the binding process is different from that of MVC. With the new .NET Core, things have changed with both the MVC and WebApi merged into the one ASP.Net Core framework. So how does model binding now work in the new Core framework? Interestingly, it behaves closer to the previous WebAPI framework. This means there are scenarios that will take you by surprise if you were accustomed to the previous MVC framework. For e.g. Submitting a JSON within the request body is particularly different now when compared to the previous MVC framework and requires you to understand these changes. In this article, I will describe how Model Binding in ASP.NET Core works, how does it compare against the previous versions of the framework and how you can customize it with your custom binders. The framework would iterate through the collection of ModelBinderProviders until one of them returned a non-null IModelBinder instance. The matched binder would have access to the request and the value providers, which basically extracted and formatted data from the request. By default, a DefaultModelBinder class was used along with value providers that extracted data from the query string, form data, route values and even from the parsed JSON body. 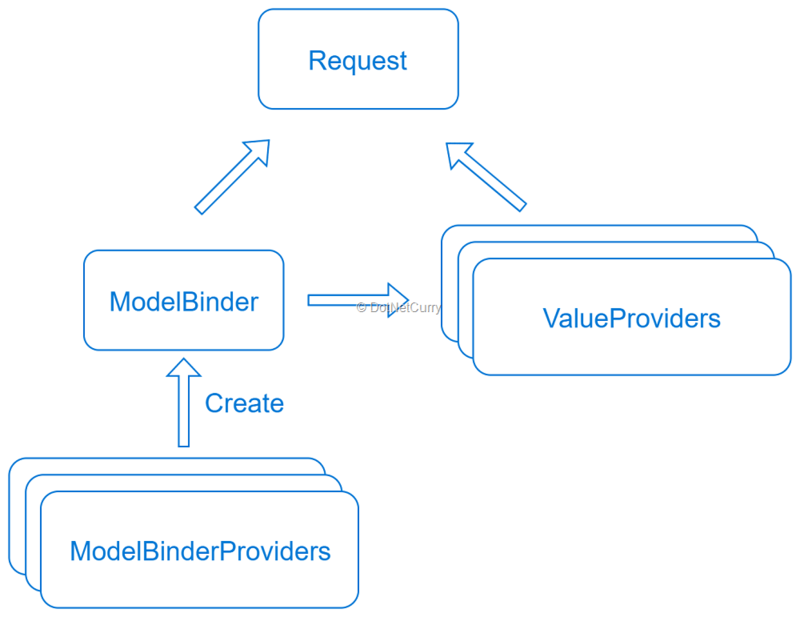 If you wanted to extend the default MVC behavior, you would either create and register a custom model binder, or a value provider. Along came WebApi which shared with MVC its design philosophy and many of its ideas, but used a different pipeline. 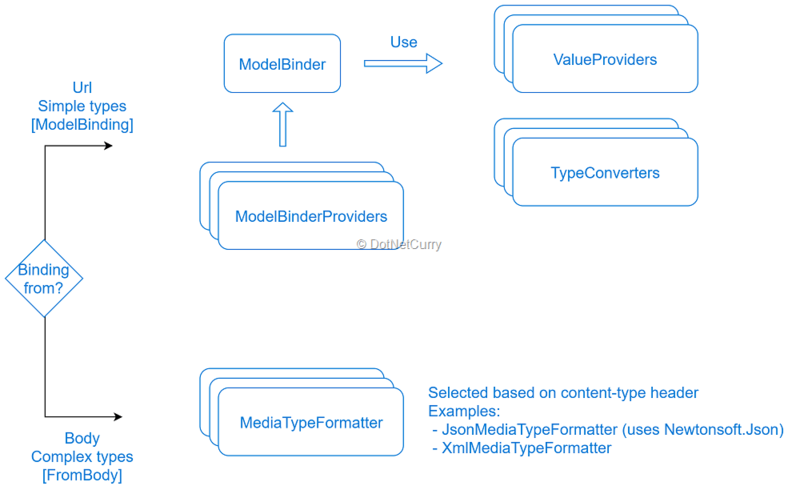 The model binding process was one of the key differences between MVC and WebApi. Binding from the body followed a different process which involved the added MediaTypeFormatters. These basically deserialized the request body into a type, and the specific formatter to be used was determined from the Content-Type header. Formatters like JsonMediaTypeFormatter and XmlMediaTypeFormatter were added, deserializing the body using Newtonsoft.Json, XmlSerializer or DataContractSerializer. By default, simple types used the Url binding while complex types used the MediaTypeFormatters. The framework also provided hooks for the user to be specific about which process should be used and to customize it, with the final set of rules described in its documentation. In ASP.Net Core, both WebApi and MVC have been merged into a single framework. However, as you read in the previous section, they had different approaches to model binding. So, you might be wondering how does model binding work in ASP.Net Core? How did it merge both approaches? The answer is that the new framework followed the direction started by WebApi, but has integrated the formatters within a unified binding process, based on model binders. The formatters are still there, now abstracted behind the IInputFormatter interface, but these formatters are now used by specific model binders like the BodyModelBinder. Knowing the model binding process followed behind the scenes is going to be critical for you to customize it. People who are used to the binding process in the previous ASP.NET MVC framework, might get particularly surprised by the changes! Not every binding source is checked by default. Some model binders require you to specifically enable a binding source. For example, when binding from the Body, you need to add [FromBody] to your model/action parameter, otherwise the BodyModelBinder won’t be used. In particular, the Headers, Body and Files binding sources must be specifically enabled by the user and will use specific model binders. There are value providers for route values, query string values and form values. Binders based on value providers can get data from any of these, but won’t be able to get data from other sources like the body for example. Although form data is posted in the body as a URL-encoded string, it is a special case parsed and interpreted as a value provider by the framework. Binding from the body anything other than URL-encoded form data, will always use a formatter instead of the value providers, with the entire model being deserialized from the body. No separated binding for each individual property will be attempted! A JSON formatter based on JSON.Net is added by default. All the JSON.Net hooks and options to customize how data is serialized/deserialized are available, like custom JsonConverters. Formatters for XML can be added, both XmlSerializer and DataContractSerializer are available. The number of different model binders with its providers that are added by default is not a small list. You can customize that list adding/removing providers as you see fit through the MvcOptions.ModelBinderProviders. If you look carefully at the list of the binder provider names, you can infer that some binders will be selected for specific model types, while others will be selected for specific binding sources! BodyModelBinder, will be selected when [FromBody] is used, and will just use the request body through the InputFormatters. ComplexTypeModelBinder, will be selected when binding a complex type and no specific source like [FromBody] is used. Whether you intend your binder to be used with nested properties. For example, if you create a model binder for properties of type decimal, it will be used when binding a parent model from the Form data, but it won’t be used when binding a parent model from a JSON body. In the second case, the InputFormatter deserializes the entire model in one go. The latter might take most people coming from MVC 5 by surprise and is the scenario we will go through in the following section. Let’s go through a typical example used to demonstrate custom model binders in previous versions of the framework. This is the scenario where dateTime fields are provided as separated date and time properties, but you still want to bind them to a single dateTime field in your model. As discussed in the previous sections, we will need to handle both scenarios differently. In the case of the form data, we can create a custom model binder. However, in the second case where a JSON is posted, we will need to customize the way the JsonInputFormatter will deserialize that property. If you have any trouble following along, you can download the code from Github. In this scenario, we have a view where an HTML form is rendered and submitted to our controller. This form will contain separated inputs for the date and time of the AppointmentDate property. So far, this is all quite standard in any MVC application. Now we need to create a new custom model binder for our AppointmentDate property. Since this is intended for posted forms, we can use the value providers to retrieve the AppointDate.Date and AppointmentDate.Time form values. For the sake of simplicity, in the code that follows, I will force both date and time values to be present in the request data. While it suits the purposes of the article, in the real world, you most likely want them to be optional and proceed with the binding as long as one of the two values is found. A similar remark must be made about the handling of different time zones, formats and cultures. I am sticking with the invariant culture and UTC for the purposes of the article, but double check your use case and needs, in case you need to handle different ones. Now we need to tell the MVC framework when to use this model binder. The approach described above requires us to explicitly tell whether a DateTime field in a model will be posted as separated date and time values, so we can add the [ModelBinder] attribute. Depending on your requirements, you might be more interested in registering a new model binder provider that will create an instance of our binder for any DateTime property, regardless of whether date and time are submitted as a single or separated fields. Before using this approach, let’s rewrite the binder so we can use the default SimpleTypeModelBinder as a fallback in case the separated Date and Time values are not found. This isn’t complicated, we just need to inject a fallback IModelBinder and use it when either Date or Time are missing. That’s it, now our custom binding logic will be used when separated Date/Time values are found, while the default binding logic will be used otherwise. If you check the code on Github, you can try the update view which uses a single form field for the AppointmentDate. You might wonder what will happen if you just get the previous form and post it using an ajax call. The code above will send an ajax request with the Content-Type header set as application/x-www-form-urlencoded. This is critical for the model binding process, as those values will be available in the FormValueProvider and our custom binder will work as expected. Everything will behave the same as when the HTML form was submitted. You will notice that our model binder is not executed, in fact the model received by the controller action will be null! The following section will shed some light on this scenario. When posting a JSON and specifying the Content-Type as application/json, the value providers will have no data available at all, as they only look at the Query string, route and form values! In this case, we need to explicitly tell MVC that we want to bind our model from the request body where the posted JSON will be found. However, by doing this we will be using the BodyModelBinder instead of the binder we got before (the ComplexModelBinder). This new binder will internally use the JsonInputFormatter to deserialize the JSON found in the request body into an instance of the Appointment class. As the entire model will be deserialized, our custom DateTime binder will not be used! So how can we customize this scenario, and deserialize the separated date and time parts into a single DateTime value? Since the JsonInputFormatter uses JSON.Net, we can write a custom JsonConverter and inform JSON.Net about it! Let’s start by creating a new converter that will verify that we have our separated date and time values, reading them both and creating the combined DateTime. Then we can explicitly register it for our AppointmentDate property using the [JsonConverter] attribute. We are using the default IsoDateTimeConverter as fall back, you might need to set its format/culture properties or use a different fallback converter as per JSON.Net date handling. The model binding process has changed significantly in ASP.Net Core, especially if you compare it against the binding process used in the previous versions of ASP.Net MVC. Those of you who are used to ASP.Net WebAPI, will find the new binding process closer to what you already know. Now you need to be aware of the different binding sources, which ones of those are available by default (like the query string or form data binding sources) and which ones must be explicitly activated (like the body or header binding sources). When customizing the model binding process, being aware of the different model binders and which binding sources these are used with, will be critical. 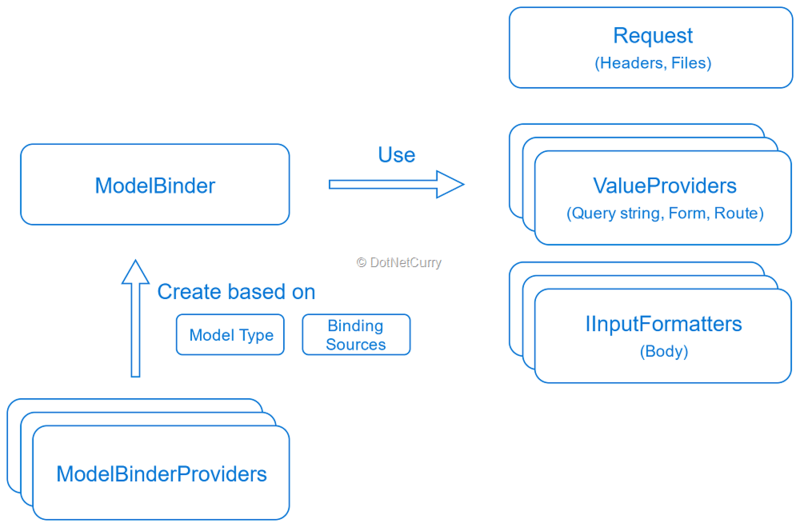 Just creating and registering a new model binder will be enough as long as you plan using binding sources available as value providers (like query string or form data). However other binding sources like the body or the header will require different strategies and extra effort. As an example, we have seen how to customize DateTime bindings when submitting forms and when posting JSON data. 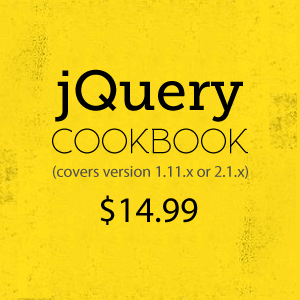 This required a new custom model binder and a new JsonConverter.